TORONTO, May 7, 2014 /CNW/ - Sustainable communities allow their residents to experience a high quality of life while minimizing ecological impact. These communities integrate and complement the natural environment through the appropriate management of land use, innovative urban design, green space and the responsible use of energy and water resources. 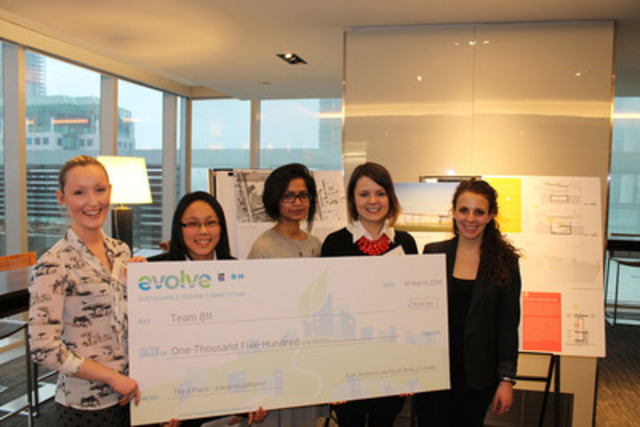 In 2012, B+H Architects, together with RBC, launched the Evolve Sustainable Design competition to challenge post-secondary students in architecture, engineering and related programs across Canada to design sustainable buildings for the future. The competition supports high-performance facility design and encourages a shift to sustainable cities. 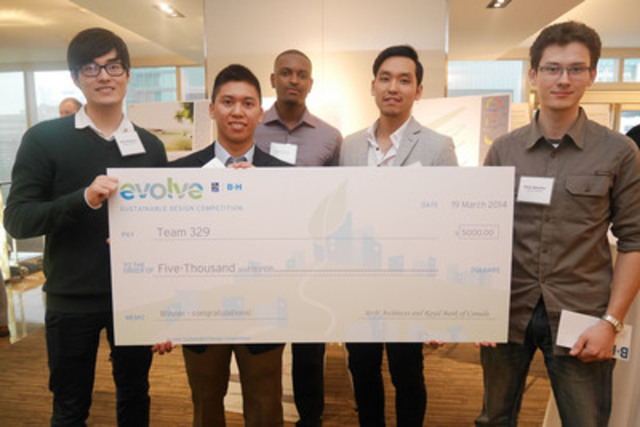 This year's challenge was to design a sports research institute that would minimize both energy and water use through site planning, building design, systems technology, and operations. "We know that sustainability is an increasing focus in curricula across the country, and we're glad to provide students with opportunities to gain experience in green building design," said Sandra Odendahl, director, Corporate Sustainability, RBC. "We are very proud of our partnership with B+H, as we work together to encourage the shift to green, livable, vibrant and more sustainable communities." 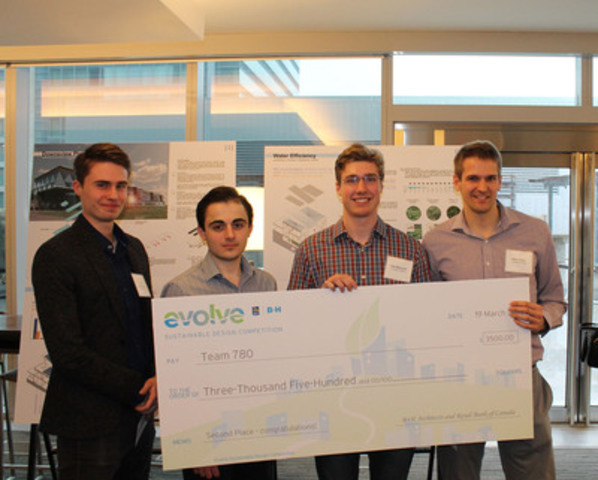 "It's a delight to be able to celebrate the talent and vision the next generation of architects and engineers are demonstrating when it comes to sustainably-designed buildings," said Kevin Stelzer, B+H Principal and Director of the Evolve Competition, "We were also pleased to partner with RBC on another great year of this competition, and to be able to hold the winners' event in the RBC Centre - Canada's tallest LEED Canada-NC Gold certified office building." The full judging panel for this year's Evolve competition included Toronto Star Architecture Critic Christopher Hume, B+H Principal Douglas Birkenshaw, Canadian Sport Institute of Ontario CEO Debbie Low, RBC Olympian and member of Canada's gold medal-winning Men's 8 rowing team Brian Price, Director of Halsall Sustainable Engineering Doug Webber, and Lateral Office founder and University of Toronto Assistant Professor Mason White, who also delivered the award reception keynote. Royal Bank of Canada (RY on TSX and NYSE) is Canada's largest bank and one of the largest banks in the world, based on market capitalization. We employ approximately 79,000 full- and part-time employees who serve more than 16 million personal, business, public sector and institutional clients through offices in Canada, the U.S. and 42 other countries. For more information, please visit rbc.com. RBC is recognized among the world's financial, social and environmental leaders and is listed on the 2014 Dow Jones Sustainability World Index, the DJSI North American Index, the Jantzi Social Index and the FTSE4Good Index. RBC is one of Canada's Greenest Employers, and one of Canada's 50 Most Socially Responsible Corporations. B+H has been in the business of shaping the built environment for over sixty years with award winning architectural, planning and interior design services delivering innovative sustainable design solutions to large scale, technically complex projects around the world. We believe in buildings that are intelligently planned, provide high returns for low cost, and focus on enhancing the relationship between, and the performance of, people and their environment. The work of our integrated global practice with offices in Toronto, Calgary, Vancouver, Seattle, Shanghai, Hong Kong, Beijing, Ho Chi Minh City, Singapore, Delhi, Dubai and Doha spans all major sectors - commercial, entertainment, healthcare, hospitality, industrial, institutional, mixed-use, residential, retail, sports and transportation.